In 2011 a Thermography Report was compiled for Heatsaver Ltd as a Product Performance Verification Exercise, to highlight the Thermal capabilities of the "Heatsavr Liquid Pool Cover". The report format is using the "Standard" report template from the selection of Report Templates available in the Testo IR software. Thermal images were taken to demonstrate the Thermal/Temperature differences between the water surface temperatures of two Spas, one treated with Heatsavr Liquid Pool Cover, and one left completely uncovered. The above thermal image and readings were taken approximately 23 minutes after the start of the test. They clearly highlight the difference in temperature between the two spas and it can be seen that the right hand spa with the "Heatsavr", has retained considerably more heat. You can download the full report below. The Association delivers nearly 1 million acre-feet of water annually to a service area in central Arizona. An extensive water delivery system is maintained and operated by the Association, including reservoirs, wells, canals and irrigation laterals. Visit www.srpnet.com/about/Facts.aspx for more information. significant. The average pool contains 10,000 to 15,000 gallons of water and evaporates its entire contents each year. In the past if you wanted to reduce evaporation or keep your pool warmer in the winter, you would have to roll out a cover made of plastic or similar material. This could be a difficult, time-consuming process. Today technological advances allow you to add a liquid to your pool to reduce evaporation. SRP has tested two different types of liquid pool covers...Both liquids form a safe, extremely thin layer of molecules on the surface of the water that reduces evaporation by 30 to 50%. Additionally, if you heat your pool, using a liquid pool cover will reduce both heat loss and energy consumption. Cost: Liquid pool covers can be added to your pool for about $2.50 to 3.50 per week depending on the size of your pool’s surface area and how frequently you add the product. 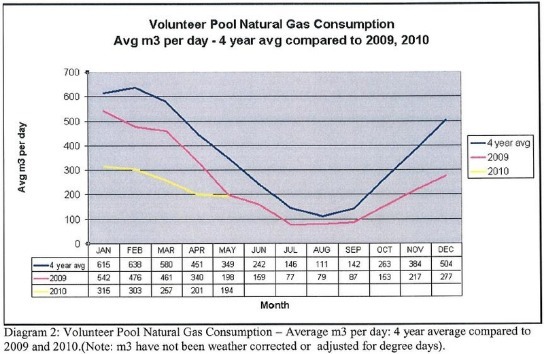 NOTE: As illustrated by the diagram, the implementation of the liquid pool cover at Volunteer Pool (Aug 2008) has significantly decreased the consumption of natural gas over the 4 year average. The City of Thunder Bay, Facilities Services Division, has determined that the energy savings together with a reduction in humidity levels and space temperature has created an approximately 40% savings in natural gas consumption. Free and combined chlorine, pH and total alkalinity (regulated by Health Standards) remained stable throughout the trial. No increase in fluctuations of the parameters was observed. Chemical parameters stayed within requirements of the Standards during the addition of Heat$avr. No microbial indicators were detected at any time and microbial quality was consistently exceptional for both minus/plus Heat$avr treatment. Non-regulated parameters monitored during the trial indicated no observable changes or fluctuations in the levels of Redox, Sodium Chloride, Calcium Hardness, Total Dissolved Solids or corrosion products (copper and iron). A reduction in condensation levels of 10% was recorded on-site by the operator, with addition of Heat$avr. Gas consumption was reduced by around 18.5%, reflecting savings of between $25-$30 per week. Indoor, heated pools in buildings with inadequate air handling systems may benefit form addition of Heat$avr, by minimising condensation and reducing heating costs. Download a copy of the entire report, including all test data, by clicking the link below. Would you like to read weekly updates about this product and the pool industry as a whole?